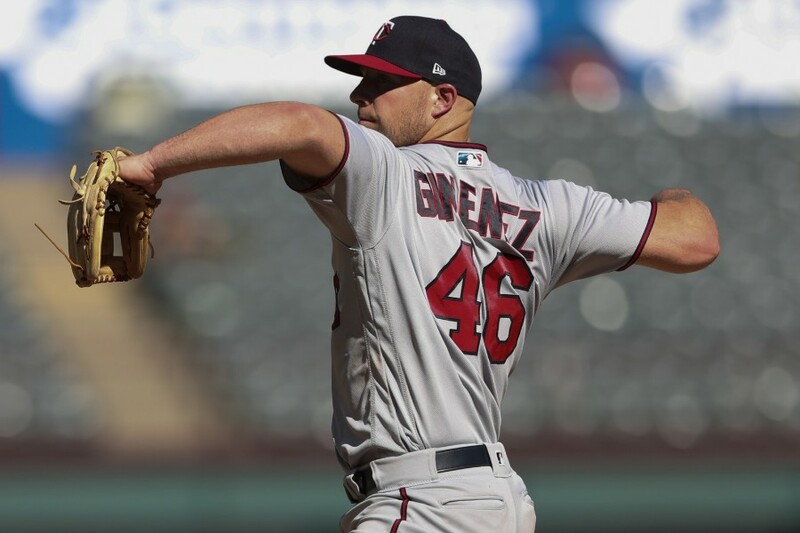 The Twins re-acquired 2017 two-way sensation Chris Gimenez at the waiver trade deadline, and his presence on the roster immediately paid off. Gimenez pitched and hit a home run Sunday. Shohei Ohtani? Pfft, who needs 'em!?!?!? Read on for the full rundown of everything you need to know (and a bunch of stuff you’d rather forget) from the past seven days. Most of the positive news coming out of Twins Territory this week had to do with the minor leagues, so you’ll want to make sure and check out the “down on the farm” section. As for the major league club, the entire starting pitching staff is struggling and the offense has had difficulties scoring runs. Pretty tough to find silver linings when that’s the case. Luckily, Jake Cave and a couple of the guys in the bullpen have continued to impress. Cave has homered in three straight games and has six homers in his last 13 games. Trevor May pitched 2 ⅔ scoreless innings and struck out six batters in the process. His ERA is down to 1.88 and he’s racked up 22 strikeouts in 14 ⅓ innings while walking just three batters. Taylor Rogers added 2 ⅔ innings to his scoreless streak, which is now at 14 ⅔ innings. He’s only given up seven hits and a walk over that span and has stranded eight of the nine runners he’s inherited in the process. Also, Joe Mauer reached another milestone this week, scoring the 1,000th run of his career, and Willians Astudillo hit his first Major League home run. Left-handed reliever Andrew Vasquez, a former 32nd-round pick who opened the year with the Fort Myers Miracle, made his Major League debut Saturday. He recorded two outs in that game, giving up an unearned run due to his own two errors. OK, so maybe that wasn’t such a hallmark moment, but debuts are always highlights in my book. The Twins’ established starting pitchers all appear to be fighting through some things right now. Kyle Gibson (5 ER in 5.1 IP), Jake Odorizzi (3 ER in 5.1 IP) and Jose Berrios (5 ER in 4.0 IP) combined for a 7.98 ERA this week. To make matters worse, the rookies struggled as well. Kohl Stewart (3 ER in 4.2 IP), Stephen Gonsalves (3 ER in 3.2 IP) and Zack Littell (2 ER in 4.0 IP) combined for a 5.84 ERA, and even combining to allow four unearned runs. So yeah, the defense was real bad too. Littell served as the “primary pitcher” in the Twins’ first experiment with the opener Sunday. It was was a complete disaster in what ended up being an embarrassing 18-4 loss. It’s not like the offense was firing on all cylinders, either. They averaged 4.3 runs per game this week even with a 10-run effort sprinkled in there. One of the big dates on the transaction calendar passed this week, as Aug. 31 was the deadline for waiver trades. The only move the Twins made was to send Bobby Wilson to the Cubs for Gimenez and a player to be named. Big news, I know. Rosters expanded on Sept. 1, meaning the Twins had enough room to activate Matt Belisle off the DL and call up Gimenez. Yay! Vasquez, Littell, Tyler Duffey and Johnny Field, were also added to the active roster. With the minor league season ending there will likely be a few more guys who join the Twins early this week. A couple players we know will not be joining the Twins are Fernando Romero and Byron Buxton. Romero has pitched a career-high 146 ⅔ innings this season, and has been showing some signs of fatigue over his past five starts, so the team is deciding to shut him down to avoid any further stress on his arm. There was a lot of good discussion already at the site about Buxton leading up to this decision. First in Nick’s Awkward Decisions article, then in Ted’s piece titled Hardball, the Twins and Byron Buxton. I don’t feel the need to rehash everything here, since it’s already been well-covered and I’m sure will continue to be a topic of discussion. Make sure to check out this week’s episode of Gleeman and the Geek for more. The reasoning the Twins, through GM Thad Levine, have provided on that move are not exactly clear. There was some acknowledgement that service time had something to do with the move, but the club is also insisting that Buxton’s left wrist injury continues to bother him. Anyway, Mike Berardino of the Pioneer Press did an excellent job of reporting on the decision. I recommend you go check out his article from Saturday evening if you’re interested in seeing how Levine addressed questions. Now that we know who’s up and who’s definitely headed home at the conclusion of the minor league season, who’s left? The only other healthy players on the 40-man roster are John Curtiss, Chase De Jong and Lewis Thorpe. Like Romero, Thorpe has already established a new career-high in innings pitched, but (unlike Romero), he’s finishing strong. Thorpe got called up to Rochester for his final four starts and pitched to a 3.32 ERA, 1.20 WHIP and 4.33 K:BB ratio (10.8 K/9, 2.5 BB/9). On the final day of their regular season, the Fort Myers Miracle clinched a playoff appearance. They entered Sunday a game back, meaning they need to win AND the team they were chasing had to lose. They pulled it off, as a 2-1 Miracle victory combined with a 5-2 loss by the Charlotte Stone Crabs sent Fort Myers to the postseason. Brusdar Graterol (4.2 IP), Jovani Moran (2.1 IP) and Colton Davis (2.0 IP) were up to the task, combining to give up just one run. Aaron Whitefield drove in a run on a single in the fourth inning, stole second base, stole third base and scored on a throwing error by the catcher. Elizabethton has already opened up postseason play, and won its matchup in the Appalachian League Semifinals. The E-Twins are trying to defend their 2017 league title, and take their eighth Appy League Championship since the turn of the millennium. Game 1 against the Princeton Rays is Tuesday evening. The participants for the Arizona Fall League were also announced this week. The Twins are sending pitchers Griffin Jax, Hector Lujan, Alex Robinson and Devin Smeltzer. The position players who are Arizona bound include Travis Blankenhorn, Jaylin Davis, Luke Raley and Brent Rooker. Additionally, Chattanooga manager Tommy Watkins will be managing the Salt River Rafters. The AFL season opens Oct. 9. The Twins head to Houston to play the defending World Series champion Astros. The series opens with a Labor Day matinee. After taking Thursday off, the Twins will come home to play their second to the last series of the season at Target Field. Game 130 | CLE 8, MIN 1: Where Did the Runs Go? Game 133 | MIN 10, TEX 7: Tex-plosion! Game 134 | TEX 7, MIN 4: Is Jose OK? What value does Chris GIminez serve this team?That is why you do September call ups so that guys get some opportunity to perform at the big league level.Even the inning he pitched today was wasted. What is my TD prize again?! On a more serious note.... what exactly is "the opener strategy," other than someone in the front office officially trying waaaaaay to hard and stepping on their....well you know. Rhythm is a huge part of baseball and this completely disrupts the starter for what again? Each time through the order is the same no matter when it is. If you don't have a starter that can go through the order three times, then start them and pull them after two times through (until you find and actual starter that can to replace them). If you want a bullpen game, then do a bullpen game. In a response to mlHouse's post ...I had been thinking about that very same thing so i decided to look at the entire organization to see if there is some secret weapon hiding in Chattanooga or something. There isnt. When you look at the body of work for the entire year its easy to surmise that there is no long term plan in place here. They are getting rid off everything in the organization that drafted, acquired, traded for, or signed before they took over The Sano situation, the Buxton fiasco, and the way the Escobar trade announcement was handled makes it clear to me that the next year will be even worse than this year. There are no midfle infielders that are major league ready until at least 2020. Yes i do mean Nick Gordon too. If Sano or Garver should seriiusly hurt themselves we are in soooo much trouble. The trades at the deadline weren't about anything except saving money. If they cared at all about bettering the team then why didnt we get at least one top tier catcher, 3rd baseman, and 2nd baseman? Jeeze we dont have enough 40 man spots to guve innings to the pitchers we already have. If Buxton has a future at all here then why did tgey acquire so many A, and AA outfielders? I dont think even they know what the hell they're doing anymore than i would in that job.Talking about it is just....sad. I read Bernadinos column. To quote, "Jake Cave has opened some eyes in centerfield". He has mine. He has some decent power if and when he hits the ball. He makes amazingly bad judgments on diving for balls, runs mediocre routes, has an average arm, and plays hard. Sans Buxton, you could easily improve the OF by moving Rosario to RF, Kepler to CF, and Cave to LF. What Jake Cave is, isn't even a CF'er on this years version of the Twins, not to speak of a CF'er on a competitive MLB team. Day game after a night game in 90 degree weather. Seems like a good idea to play your bench. A starter after an opener that neither have had great success. The bench is what it is because the young fringe players are not doing very well enough to be called up and being left on the 40 man roster. You can't promote what is not there. Rosenthal's take on Buxton matches Gleeman and Bonnes as well as most of us posting.Poor decision - another mark against the FO for me.
. The trades at the deadline weren't about anything except saving money. They acquired something called "prospects" for all the players we traded away. Have you seen Tyler Austin play? He's looking pretty good. Would you rather have all those vets still here in that disastrous game yesterday and get nothing for them as they hit FA? I can't say I'm a huge fan of the front office but they did the right thing at the trade deadline. The front office did the right thing at the trade deadline. All players are eligible to come back to the Twins, if desired on both sides. Or the Twins can sign a bunch of players for limited contracts again while they wait for prospects to develop of players on the team to once again prove they belong. Sadly there isn't a lot of players other teams desire on the Twins.Two: Gibson and Rosario. Both need to be extended or you see what you can get and work towards 2020/2021. Berrios does need to be locked down. Is Austin the second doming of Chris Parmelee or the Real Deal. Mauer is a decision to be made. Really, who NEEDS to still be added to the 40-man. The list of guys going to Arizona is a list of those with "close to majors" potential. Sadly, Zach Granite is no where to be seen. Buxton - you either will be the next Aaron Hicks or one of the most expensive players ever in baseball. The choice is Byron's. The Twins hedged themselves for more of your play (as they did by shutting down Romero). Still a good 15 names on the roster that don't really need to be there. Can anyone name them? Be the next Aaron Hicks? We should be so lucky. Hicks would be the Twins best player today.